I taught a freshman seminar called The Psychology of Violence and Nonviolence for many years. It touched on such topics as aggression, conflict, mediation, and movements of nonviolent social change such as the U.S. Civil Rights Movement. By the second week of each semester, I was invariably approached by students who were dismayed to discover how unfamiliar they were with this important material. 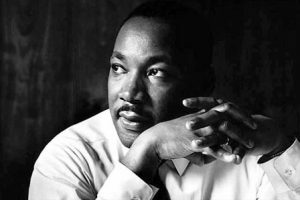 The successes of the Civil Rights Movement were due in large part to the nonviolence training that Dr. Martin Luther King Jr. insisted upon for those who participated in his campaigns. Why don’t students know more about this aspect of our country’s history? The gap seems especially tragic in this “time of heightened awareness” (in the words of the airport security warning), when fear of violence is the constant backdrop to our lives. Dr. King wrote about his commitment to nonviolence in his first book, Stride Toward Freedom, which tells the story of the Montgomery bus boycott. In the middle of this readable book, there is a fascinating chapter in which King recounts his own pilgrimage to nonviolence, and proposes six principles of nonviolence for his movement. But Stride Toward Freedom went out of print in the United States for about thirty years. Somehow, this book never made it into our nation’s schools on a significant scale, either as required, or even recommended, reading material. Yet Stride Toward Freedom is a riveting, historically important American document. Today, most students are not aware of Martin Luther King as an author, and have never read any of his work. This is a shame, because although the man lived to be only 39 years old, he bequeathed to us several books and collections of speeches and sermons. We should be making better use of them, especially in schools. His writing is readable, and full of important ideas about how people can live together with a greater measure of peace and justice. We have put Martin Luther King on a pedestal without seriously studying him. To be fair, students do know a little. They know that he “had a dream.” They can recognize his picture, most of the time. They may know that there is a national holiday for him. But they don’t know about his principles of nonviolence, his surprising practical ability to form coalitions of people across polarized lines, or the products of his leadership, such as the Civil Rights Act of 1964 and the Voting Rights Act of 1965. Some students even get confused about whether he was in the Civil Rights Movement (now five decades past) or the Civil War (only fifteen decades past)! On the other hand, studying nonviolence comes easily to students once it is made available, and seems to equip them to interact more successfully with other people. One student came in to report that she handled a dispute with her roommate better as a result of something discussed in class. Another said that for once when he was home over the weekend he didn’t get into a fight with his girlfriend. Teachers of nonviolence and peace studies hear accounts like this regularly, which is gratifying. The cast of characters in each of our lives is different, and yet interpersonal relationships are important to us all. Stories of nonviolence are often about relationships – about transcending hostility to make and preserve friendships. If we put examples of good relating in front of our young people, they will often figure out how to extract something that they and their own cast of characters can use. To state the obvious, relating to friends is something young people do a lot. That is why nonviolence can be a centrally important avocation for them. Although my students felt, looking back, that they had missed something in their education, their annoyance contained seeds of energy and motivation. Like King, most of them would rather get on with the task of restoring and uplifting people than complain. Young people naturally want to learn about nonviolence because they see it as a form of positive activism. Let’s help them with this learning, and in the process reclaim what Martin Luther King’s work was all about. My recommendation is that we at least read what Dr. King had to say. A Testament of Hope, edited by James M. Washington, is a collection of writings and speeches by Dr. King. It makes a great addition to any home library. The Autobiography of Martin Luther King, Jr., edited by Clayborne Carson, is not a traditional autobiography. It was put together by Professor Carson, director of the King Papers Project at Stanford University, using Dr. King’s own accounts of his life and thought, drawn from many sources. It is chronologically organized, making it useful for tracing the development of Dr. King’s ideas and concerns. Adapted from an article that first appeared in Peace N Plenty News, 7, November 2007.